Philips Electronics UK held a one day conference at a London hotel for its finance group focusing on culture change. The agenda included discussions about what staff members considered culture to mean and how they could accelerate culture change within the company. Throughout the day, delegates were asked to answer a series of questions using Group Dynamics Smart Devices. Only 2% of the audience voted that a change of culture was not necessary. A series of workshops were also held alongside break out discussions and group feedback. The conference also looked at career progression. A series of poll questions were asked including where individuals saw their future within the finance group and the best pillar for career advancement. Voting results were displayed instantly. Delegates were able to get creative later in the day by becoming film directors and making short adverts on our 10-inch Smart Devices. Working in teams, the delegates were each given a prop such as a vacuum cleaner, a holiday company, an item of clothing or a drink product. Each team then had ten minutes to create an innovative marketing advert to promote their brand and record it on their Smart Device. The ads were then displayed to the whole audience with the best adverts and directors scooping ‘Oscar’ awards for their efforts. 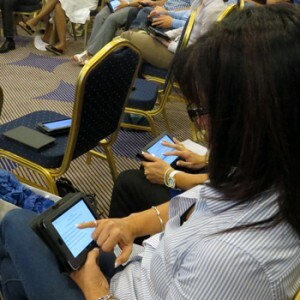 Guests were then asked to rate the day by answering a series of feedback questions on the tablets and were also able to use the Smart Devices to send in their own ideas for culture change via the Message Gateway. 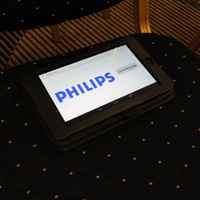 How do you rate the relevance of this session to the changes happening at Philips? Which of these topics interests you the most? The final question of the day asked the audience for their opinion about how confident they are now to make the changes to the culture within the company. Over 90% of the audience responded positively. There was positive feedback following the event especially as attendees enjoyed the interactive element of the voting sessions and the team building activity using our Smart Devices. The day was rounded off with a scenic trip on the Thames in a ‘Duck’ – An amphibious vehicle used in the D-Day landings in 1944, followed by dinner at Altitude on the 29th floor of the Millbank Tower.